Above: Athens, 1965. 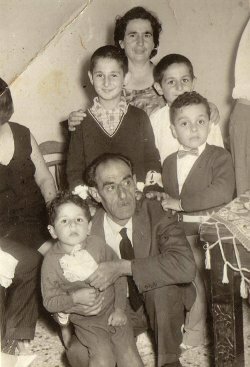 I am with my mother, Eugenia- who is holding my brother, Ioannis; my granfather, Ioannis Laskaris- who is holding my brother, Dimitrios. I am next to my brother, Ioannis- wearing white. 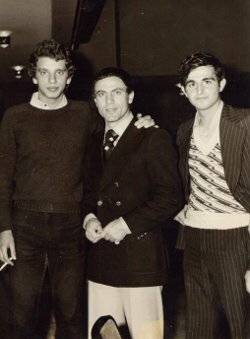 Above Right: Here I am with one of my football idols, Mimis Domazos (centre), of Panathinaikos. The other player is Vagis, who played for Egaleo and Panathinaikos, We are at the nighclub, Deilina, on a Special Night for Professional Players (1977). 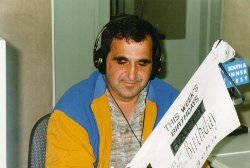 Above: As a radio commentator on the Greek program, 2NBC. I worked on the stattion for six years. I have also worked as a sports journalist for the Kosmos newspaper and currently at the Hellenic Herald.